- Home many shakers can 1 Amp power? 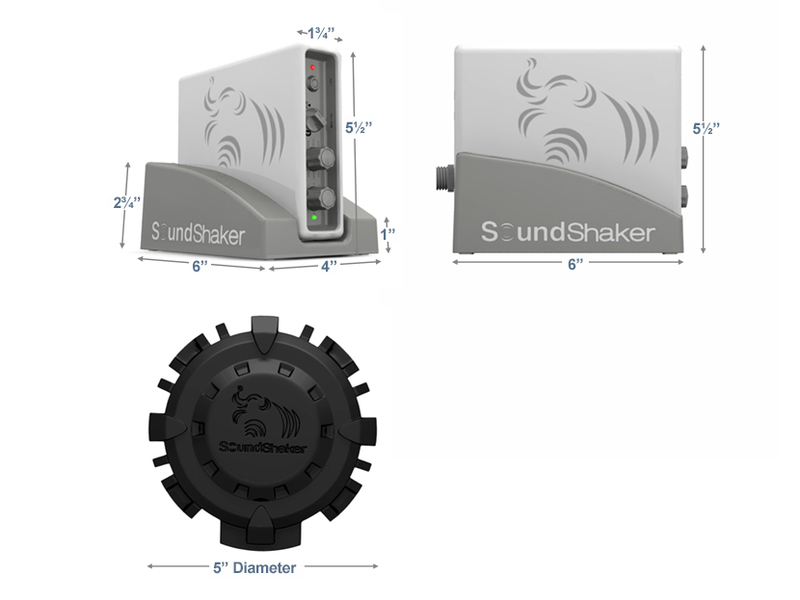 - The SoundShaker Amp can power up to 4 shakers at once. - What equipment do you need to hook up the SoundShaker system? - Any audio receiver that has a subwoofer(dual or single) output. - Can you adjust the intensity of the vibration? - Absolutely. There is a Power and Crossover adjustment to dial in your desired level. - Can you sync multiple SoundShaker Amps at the same time? - Yes, you will be able to sync as many amps as you need to power your chairs. This device uses the low frequency bass sounds from your receiver to create its stunning tactile effect. The Soundshaker is compatible with all major receivers, so that it can readily adapt to any audio setup. The connection between your receiver and the Soundshaker amplifier is wireless, for an easy setup and seamless experience. The Soundshaker is compatible with both single and dual bass output receivers. This control on the amplifier allows you to cross over from low to mid-high frequency ranges, for an expanded audio landscape.